Use for seasonal allergy marked by sneezing, watery eyes, nasal congestion, and sinus headache. Also for acute and chronic sinus infection marked by thick yellow nasal discharge. 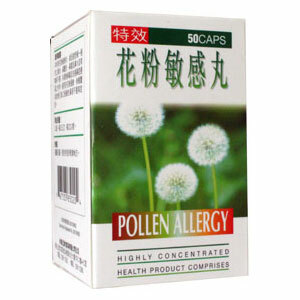 Pollen Allergy Capsule is a popular traditional Chinese herbal supplement, specifically recommended for acute and chronic rhinitis, sinusitis and allergic rhinitis. It is an effective choice for relieving various nasal and allergic conditions caused by pollen and other food substances. Dispels pathogenic wind, clears heat, resolves toxin, transforms phlegm, dispels turbidity, diffuses the lung, opens the nasal passages, dispels damp. Allergic conditions caused by pollens, seafood and other food substances, chronic or acute sinusitis, allergic rhinitis, coryza, rhinopharyngitis, purigo, rubella and other skin disorders. Use for seasonal allergy marked by sneezing, watery eyes, nasal congestion, and sinus headache. Also for acute and chronic sinus infection marked by thick yellow nasal discharge. Heat and redness around the sinus cavities, and sinus pain or headache. Applicable for earache or congestion, and common cold marked by nasal congestion.